February 18, 2010 - Approximately 94 percent of the pilots at the German Airline, Lufthansa have called for a strike that will take the form of a “walkout” from Monday at Midnight, February 22 through 25th. The pilots union, Vereinigung Cockpit (VC) reported their pilots 2006 contracted ended April 2009, Lufthansa has only brought one offer to the table “we received only one offer for none of the open collective agreements” and it does not address wages and the and potential plans of the company to move pilot positions to their lower paying subsidiaries. Deutsche Lufthansa is the largest airline in Europe in terms of overall passengers carried, and the flag carrier of Germany. The airline is the world's fifth-largest airline in terms of overall passengers carried, operating services to 18 domestic destinations and 183 international destinations in 78 countries across Africa, Americas, Asia and Europe. Together with its partners Lufthansa services around 410 destinations. With over 530 aircraft it has the third largest passenger airline fleet in the world when combined with its subsidiaries. Subsidiaries: Air Dolomiti, Austrian Airlines, BMI, Brussels Airlines, Eurowings, Germanwings, Jade Cargo, JetBlue, Lufthansa Cargo, Lufthansa CityLine, Lufthansa Italia, Luxair, SunExpress, Swiss International Air Lines and Ukraine International Airlines. Lufthansa reported “the German pilots’ union, Vereinigung Cockpit, has announced its decision to call Lufthansa pilots out on strike. The decision comes despite the willingness shown by Lufthansa to reach a negotiated settlement demanded by the pilots’ union at long and intensive talks. In addition to demands on job security, however, the union also insisted on a greater say on fundamental entrepreneurial issues, equating to intervention in business management at the Airline. That demand cannot be accepted”. “A strike will appreciably damage the Company, its customers and staff. The union’s call for strike action, despite numerous proposals on job security put forward by Lufthansa is entirely inappropriate. In the interests of the Company and its customers, the Vereinigung Cockpit pilots’ union is urged to return to the negotiating table in order to work out a constructive solution to the dispute. 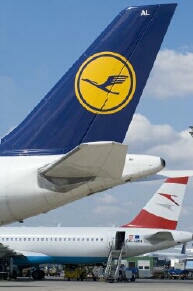 Lufthansa will go to every length to minimize the impact of a stoppage on customers and passengers”. Should travel be interrupted by the strike passengers can cancel their flight booking free of charge. Lufthansa has set up a free number – (800) 850-6070 for customers to call and obtain information about their flight bookings (re-bookings/cancellations). Information about ongoing flight operations can be acquired at any time under “Arrival and Departure” at Lufthansa website. Passengers already booked on a Lufthansa flight for this perios can rebook once free of charge on another Lufthansa flight, if they wish to change their travel plans provided their ticket was issued before February 18th. The new travel date must be before March 31, 2010 and no change is made in their departure and arrival destination. Passengers travelling within Germany can switch to a journey by rail with Deutsche Bahn, if their flights have to be cancelled. For that purpose, they must exchange their electronic ticket (etix) for a travel voucher at a Lufthansa automatic check-in terminal. Alternatively, customers can buy a train ticket for the route for which their flight ticket was valid. The train ticket can then be submitted with the flight ticket to Lufthansa for a refund.